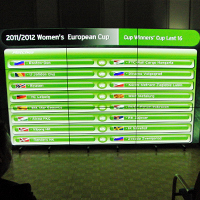 15.11.2011 - The draw for the Last 16 of the Women’s Cup Winners’ Cup took place on 15 November 2011 in Vienna. AUT Union Korneuburg BEL Initia Hasselt BIH RK Katarina Mostar BLR Gorodnichanka CYP A.C. "Latsia" Kentriki Asfalistiki CZE Britterm Veseli nad Moravou DEN Randers HK DEN Viborg HK ESP BM. Elda Prestigio ESP BM. Mar Sagunto FRA Toulon Saint Cyr Var Handball GER HC Leipzig GRE O.F.N. Ionias GRE Ormi-Loux Patras HUN Alcoa FKC HUN DVSC-Forum Debrecen HUN FTC-Rail Cargo Hungaria ISL Fram ITA HC Sassari KOS KHF Kastrioti LTU HC Garliava-SM MKD HC Zito Prilep MKD WHC Metalurg NED MizuWaAi Dalfsen NED Westfriesland SEW NOR Byasen NOR Levanger HK NOR Tertnes Bergen POL KGHM Metraco Zaglebie Lubin POL Vistal Laczpol Gdynia POR Gil Eanes - Lagos POR Madeira Andebol SAD ROU HC Otelul Galati ROU U Jolidon Cluj RUS Dinamo Volgograd RUS Rostov-Don RUS Zvezda Zvenigorod SLO ZRK Krka Novo mesto SRB RK Zajecar SRB ZORK Jagodina SUI LC Brühl Handball SUI LK Zug Handball SVK IUVENTA Michalovce SWE IK Sävehof TUR Izmir BSB SK TUR Üsküdar B.S.K.